Recordnando a Dios, todos los errores son purificados. Y rodos nuestros ancestros son acogidos y slavados. Dios esta en tu interior, Dios es infinito. Que tu sustento sea el canto de la alablanza de Dios. Que la preoccupacion nunca te consuma. Y que los pios de loto de Dios sean la flor. Como el gavilan encuentra la gota de illuvia, y prospera. This is my blessing for Itziar and Michael’s daughter Luz (pronounced Luth), who is of Spanish and English descent and who was born on the 9th day of March 2011, the night of a crescent moon and the transition of the planet Uranus into the firey sign of Aries for the next 84 years. 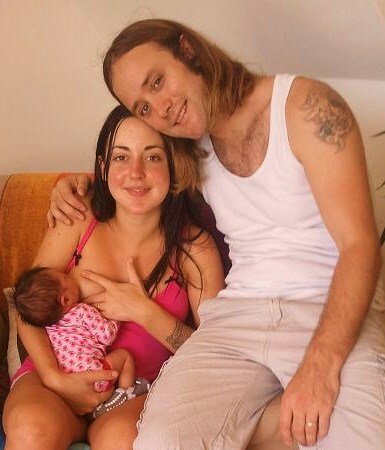 Itziar and Michael came to me early in the pregnancy to book for a natural birth and right from the start they were both confident that a homebirth was the way to go. They never doubted their decision for a moment, even when the baby lay breech for a few months, nor when they did not have a house to move into for the birth. Michael is from the U.K. and showed me a book his mother had written about exercises for natural childbirth and mentioned her involvement in the natural childbirth movement. His knowledge about birth was intrinsic to his being, because this knowledge had been handed down to him by his mother from the moment he could remember. I call it confidence. Itziar’s mother is Spanish, has four children, all of them born naturally. So there was never any doubt that Itziar would have a natural birth. Itziar laboured gently during the day, cared for by Michael and her mum, Christina, in turns. Itziar’s mind rested as her body relaxed into the loving arms and massaging hands of her trusted ones. As her body relaxed, so the birthing hormones, oxytocin and the endorphins, increased their pulse like release, allowing the mouth of the womb to open as the baby poised and pressed through the birth canal. Towards the evening the intensity of the labour increased and as the cresent moon rose in the sky, Itziar began to show some of the precursor signs of the ‘foetal ejection reflex’, a spontaneous mechanism that releases the baby from the mother’s body. Itziar felt the pain of labour mostly in her back and we took it in turns to massage her lower back or just hold pressure there with our palms. This is the hardest part of the labour for the mother, as well as for those supporting her, because it is at these moments when a mother will express the greatest fear and discomfort. This can present itself in different ways and words like ” I can’t do this any more”, “I want to go to the hospital, NOW!” or “Please, please stop this Marianne”. This fear aspect of the labour indicates the release of adrenalin, which occurs in order to mobilise the mother to release the baby from her womb. The worst way to interact with the mother in these moments is to try and reason with her. To think and to reason are neocortex activities – the part of the brain that needs to be inactive during childbirth. These are primal fears, verbal expressions of the most primitive parts of the brain, what we term the primal brain. Reassurance, yes; Reasoning , no. For most humans, witnessing someone else’s distress without becoming distressed themselves is quite difficult. We are like babies in a nursery (terrible example), but if one baby cries, soon all the babies are crying. All humans resonate with the emotions of others and it is not easy to remain calm and allow someone else to express their primal fears, or loss, or grief without intervening. In hospitals this ‘intervening’ happens all the time to women in labour. Intramuscular opiates given like chocolate, epidurals, caesarian sections when a mother is “not dilating fast enough”, vacuum assisted deliveries. I could go on. What midwives have to learn, is to “be there”, quietly, peacefully, empathetically, reassuringly. A birth attendent needs to be confident that the signs she is observing are signs of normal physiological labour. This confidence is a resonance which is in turn imparted to the birthing mother. To get back to the story, Itziar couldn’t find a comfortable position and definitely did NOT want to be reclining in any way. She sat on the bed for a while, then we moved to the bathroom, speaking in sotto voice, laughing gently at a few timely placed jokes! Water had been relieving during the labour and Itziar had been in and out of the bath. This time, Christina switched off the lights and fetched and lit candles. Itziar got into the bath with Michael, who supported like a pillow from behind. The candlelight flickered as we waited and imparted love and reassurance. Quite suddenly, Itziar came forward into a more upright position and roared like a lion, shouting, “The Baby ‘s coming, I can feel it coming” and within three mighty efforts of bearing down, Luz was born. Not once did I utter the direction to “Push”. It was completely irrelevant. There was no tearing, and within seconds Itziar was radiantly smiling and Christina, Michael and myself were crying with joy and relief. The birth of Luz was undisturbed and virtually unassisted. I did not ‘manage’ the labour or the birth. If anything, I ‘managed’ myself so that my body, mind and emotions were calm and unintrusive, and could allow the force of the Great Mother to bear fruit. The Great Mother was with us all, imparting the wisdom of ages through Christina to her daughter Itziar, and on to her new granddaughter Luz. Wisdom came through Michael’s mother, with Michael, to the birth of his daughter Luz. What a blessed honour to participate in this event of Great Mother Wisdom. Oh, my child, this is your mother’s blessing. Worshipping forever the Lord/Great Mother of the Universe. Remembering God/Goddess, all mistakes are washed away. And one’s ancestors are redeemed and saved. God/Goddess is inside you, God/Goddess is infinite. May you love to be with the saints. May your food be the singing of God’s/Goddess’s praise. Drink the nectar of God’s/Goddess’s name and live long. May meditation on God/Goddess bring you endless bliss. And let the Lotus Feet of God/Goddess be the flower. Like the sparrow hawk finding a raindrop, blossom forth. Mothering is a skill that is passed on from older mothers, who have kept or rediscovered the wisdom of the ages, to the young mother. Clarissa Pinkola Estes writes ” The older women were the arks of the instinctual knowing and behaviour, who could invest the young mothers with the same. Women give this knowing to each other through words, but also through other means. Complicated messages are conveyed through a look, a touch with the palm of the hand, a murmur, or a special ‘I cherish you’ hug. Give me the key that will open the gate. I have sent you an email with this song – it is beautiful. Please share it with your lovely couple with love from me. You are a remarkable person Marianne. What skills you share with all your mums.